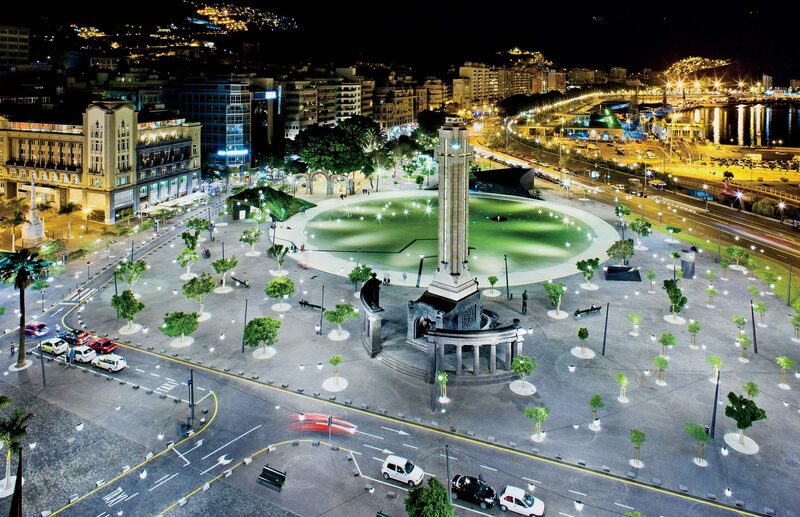 ￼Plaza de España, Santa Cruz de Tenerife, Spain: The centerpiece of this public square in the Canary Islands, finished in 2008 by Herzog & de Meuron, is a giant wading pool. A black line on the bottom traces the outline of a castle wall built centuries earlier to protect the city from pirates. 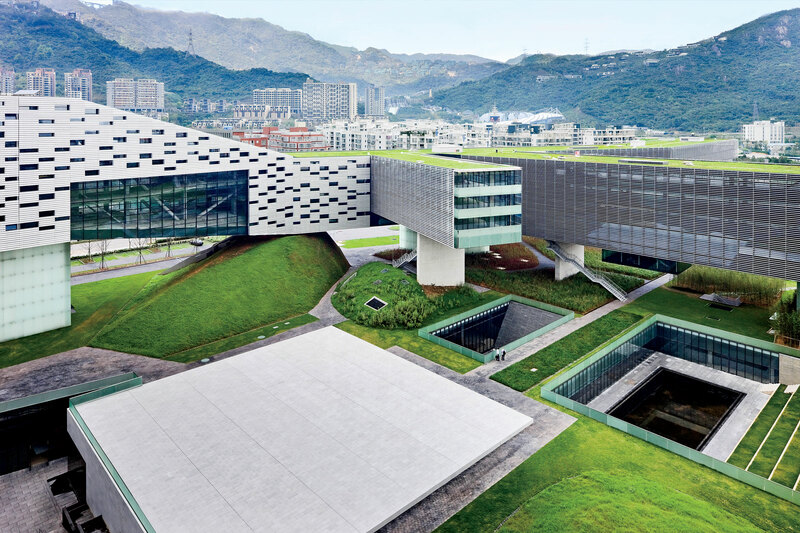 Four pavilions with green roofs house an information kiosk, a shop, a café, and access to underground parking. 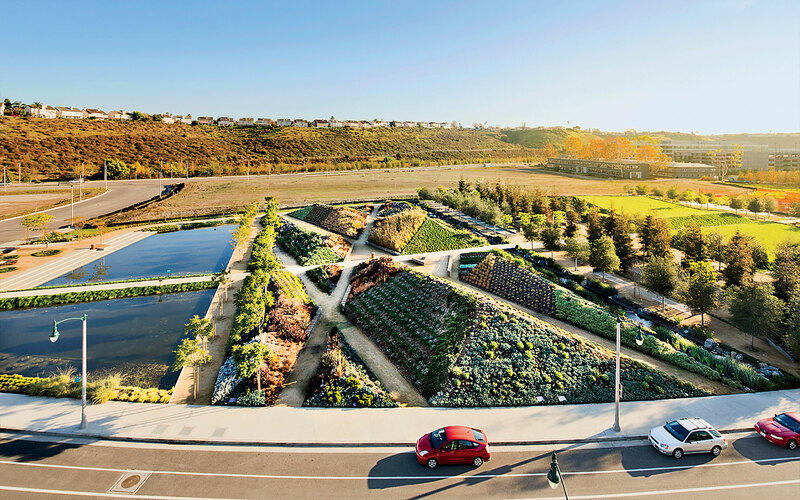 Across the globe, cities have discovered that unlovely infrastructure and scarred old industrial land can be transformed into lush, strollable oases. More than two hundred years ago, when New York’s grandees were scheming about how their city should continue swallowing farmland and forest, they figured there was no need to plan for a park. The waterways that encircled Manhattan already provided fresh air and open space, they thought, and so instead they gridded the map with streets, leaving only a couple of muddy parade grounds and potter’s fields. When wealthy families demanded a carriage course at least as pleasant as London’s Hyde Park, the oversight became too obvious to ignore. By the mid 19th century, parochial competitiveness had given birth to Central Park, which still holds the key to the city’s livability. I’m there virtually every day, walking my dog, picnicking on a bench, biking to a meeting, or tapping paragraphs like this one into my phone. Today, as urban land becomes ever rarer and more precious, the value of outdoor refuges has risen, too. Superstar cities like New York, London, Seoul, and Tokyo keep drawing billionaires, immigrants, students, coders, artists, and entrepreneurs, all of whom crave a bit of friendly turf. These gilded metropolises have entered a new era of urban parks, made possible by a legacy of ugliness. Each has its polluted waterfronts, abandoned train tracks, decommissioned military installations, or redundant highways, all waiting to be revived into verdant zones of leisure. Now greenery has sprung up in areas that once lay dank and useless behind chain-link fences. Vanke Center, Shenzhen, China: For its corporate campus, the Vanke Corporation, one of China’s largest real estate developers, commissioned Steven Holl Architects to create a “horizontal skyscraper” as long as the Empire State Building is tall. Built in 2009, it floats above lush gardens that are open to the public, where restaurants and cafés sit alongside walkways, pools, and tropical foliage. The grand old parks of Europe, like the Bois de Boulogne in Paris, began as hunting grounds and vast suburban estates, but their successors are smaller and less wild, planted on strips of salvaged land. Their charm lies more in the inventiveness of the rescue than in their expansiveness. Each summer in modern-day Paris, a segment of the city’s riverside traffic artery becomes a string of temporary beaches called Paris Plages. Recently, the city added a permanent haven on the Left Bank: now Parisians can stroll down former on-ramps to the Promenade des Berges de la Seine, where gardens float on moored barges, children hold birthday parties in public tepees, and adults can retreat to sanctuaries installed in steel shipping containers. It takes a sturdy memory to appreciate the extent of these metamorphoses. Landscape architects have infused menacing, oily zones that evoke movie gangsters with fresh civic joy. In the Boston of my youth, an elevated highway moated the center city, where the only sign of the harbor was the rapacious gulls. On a recent visit, I found the view to the water open, the road gone. In its place was the Rose Kennedy Greenway, a landscaped path that arcs from Chinatown to the North End. Boston’s transformation is part of an epochal worldwide shift. Industry invigorated, and later wounded, cities of all sizes. Now they face the same task of reversing blight, with nature’s help. The architecture firm Snøhetta is in the midst of converting an abandoned paper mill in the town of Oregon City, just south of Portland, into the Willamette Riverwalk, where the public will encounter a waterfall thundering past preserved industrial ruins. Playa Vista Central Park, Los Angeles: Completed in 2010 as part of Playa Vista, an ambitious development project still under way on L.A.’s west side, this nine-acre park by architect Michael Maltzan and landscape architect James Burnett is defined by crisscrossing pedestrian bands that connect offices to ponds, playing fields, and a UFO-like band shell. You’d think that cities saddled with dead factories and abandoned train tracks would always make the easy call to turn them into parks. Actually, the disused freight-rail viaduct that runs through the west side of Manhattan was almost torn down before being recycled into the celebrated High Line. Now, some farsighted cities aren’t even waiting for obsolescence to kick in, wrapping parkland around working transportation systems. In Seattle, the architecture firm Weiss Manfredi draped Olympic Sculpture Park over a roadway and train tracks, connecting the city with Elliott Bay. The trains rumbling through the site become mobile sculptures, and a Z-shaped path descends from the park’s highest point to a bike path and a pebble beach. Even brand-new cities are mimicking these land-scrounging strategies. In Sejong City, South Korea’s still incomplete administrative center, the landscape architect Diana Balmori is linking the rooftops of government buildings with a sinuous aerial park. Frederick Law Olmsted, the designer of Central Park, proposed that urban nature could function as a kind of spiritual medication. Cities, he argued, suffered “grave drawbacks” that afflicted inhabitants with “loss of faith and lowness of spirit.” Cultivated landscape, he and other reformers believed, could alleviate these miseries. Today, we ask urban parks to do even more than just make us happy and healthy. They must also fight climate change, leach toxins from the air, mitigate summer heat, absorb floodwaters, redeem garbage dumps, promote democracy, welcome birds, and generate revenue. Parks are hardworking places. ￼Miami Beach Soundscape Park: Located on the campus of the Frank Gehry–designed New World Symphony building, this five-year-old oasis by the landscape architects West 8 brings the concert-hall experience outside. 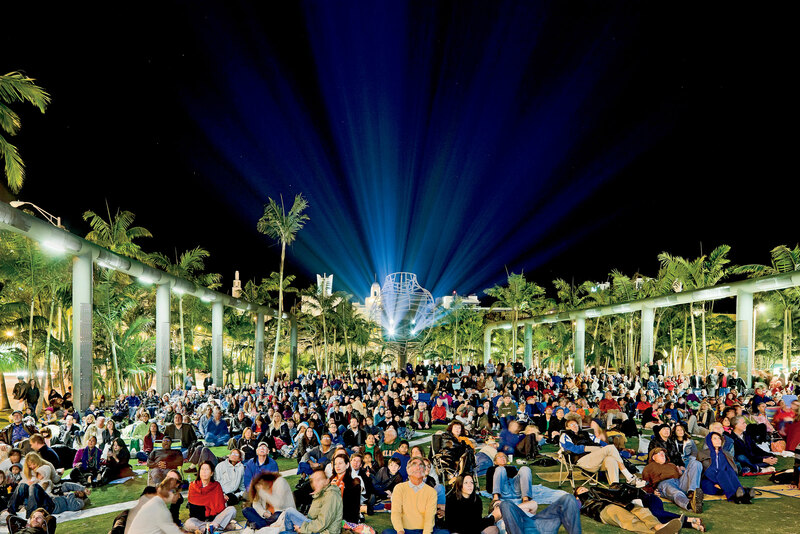 A long palm-tree-lined lawn provides a gathering area for free movies and concerts, as well as projections of performances next door. Copenhagen has even sought to invest landscape with the power to heal social fractures. A half-mile strip of open space called Superkilen scythes through the ethnically varied Nørrebro neighborhood, mixing fragments of cultures as it goes. The artist group Superflex, the landscape designers Topotek 1, and the architecture firm BIG collaborated to segment the terrain into three color-coded portions: green, red, and black, each with its own topography. Here, division unifies, since nearly every immigrant or visitor will stumble across some artifact from back home. In the black square, toddlers slide out of a Japanese plastic octopus, teenagers sprint up artificial pin-striped hills, and adults perch on the tiled, starshaped Moroccan fountain to chat. A collection of international bric-a-brac dots the red section: a donuts sign from Pennsylvania, a set of Bulgarian chess tables, a Thai-boxing ring, and so on. Superkilen is both a magnet and a microcosm, luring neighbors to a common ground that is unique yet strangely familiar. This new generation of public parks doesn’t aim to block out the intensity of urban life, but to capitalize on it. Landscape weaves among towers, hard surfaces alternate with spongy lawns and delicate wetlands. Architectural follies frame views of skyline and horizon. On a spring afternoon in Santa Monica, one of those sharp California days when every cactus blade looks honed and dangerous against black shadows, I wandered through the new Tongva Park. The landscape firm Field Operations transformed a parking lot between City Hall and the ocean into a showy haven, meant to funnel some of the beachfront magic back to the upland blocks. I followed curving allées around contoured hillocks, and a corkscrewing ramp swept me up to a lookout point canopied by a swooping steel trellis. It struck me as simultaneously romantic and ruthless, a tough variation on bucolic charm. 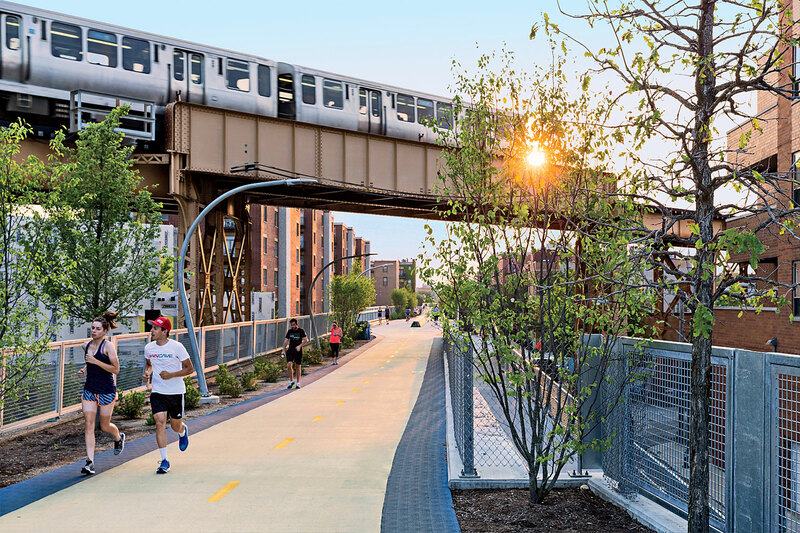 The 606, Chicago: Named after the Windy City’s zip-code prefix, this year-old, 2.7-mile elevated greenway has inevitably been likened to New York’s High Line. Designed by a multidisciplinary group led by Chicago’s Collins Engineers, it, too, is a showcase for native trees and plants that is situated on abandoned elevated rail tracks. But it also features cycling access and a trail that dips and rises to reveal the steel walls of the original structure. The ultimate expression of the new urban-greenway aesthetic is New York’s Brooklyn Bridge Park, slung alongside the elevated Brooklyn-Queens Expressway opposite the pincushion of lower Manhattan. Over many years, the landscape architect Michael Van Valkenburgh has overseen the transformation of an abandoned stretch of pitted concrete and crumbling bulkheads into a busy little Eden. Meandering walkways lead past hidden gardens and lurking sculptures. Specialized piers jut out from a narrow ribbon of green, covering a range of habitats, from cultivated meadow to tiny beach, kayak launch to soccer fields. On a warm summer evening, the skyline of lower Manhattan appeared to rear just a little higher against the fuchsia sky at twilight. It looked like décor for an immense block party. All of Brooklyn seemed to have slid toward the shoreline to play basketball, lounge, barbecue, run, and watch movies. As I observed the ebb and flow of activities, I wondered why it had taken so long. But greening derelict sites is neither easy nor cheap, and the benefits often seem uncertain. Planting a garden on a bridge (as Thomas Heatherwick has proposed for London) or building a bower on a pier (as he is doing in New York) strikes many as selfindulgent. But even if such Seussian extravaganzas fall through, or out of fashion, the need to plow parking lots into paradises won’t abate for a long time. There just aren’t enough old hunting estates to go around.